"Fast Forward has started me on a new journey and taught me a new way to lead"
Fast Forward, East Africa’s premier leadership development programme, is about building WISDOM in business leaders: developing the deep insights and acute judgement that separates great leadership from the merely humdrum. FFWD does this by assembling a small group of current and future leaders and training them to think deeply about the real questions of leadership. Fast Forward is aimed at current leaders who want to deepen their wisdom, and at those being groomed for future leadership. It also targets those who have had the nerve to start their own organisations and who want to raise their game. Each annual group contains a stimulating mix of people, to reflect the diversity of styles and contexts of modern business leadership. The programme is designed to be pragmatic, participative, and fit for Africa. A great experience, full of transformative learning. Fantastic networking opportunities. I cannot thank you enough - you’ve changed how I see my business, employees and customers. I loved the leadership journey and a new momentum for 21C. The future belongs to doers! A sometimes laugh-out-loud, sometimes deeply intrusive, sometimes deeply emotive personal journey of discovery. Ultimately I found myself! I should have come on FFWD earlier! The FFWD signature has inspiring and really powerful messages. Several light-bulb moments on so many fronts! Enlist your people in a clear statement of purpose, and communicate a compelling and powerful strategy. Understand the centrality of the customer or beneficiary in any organisation, and forge a unique emotional bond that lasts for decades. Understand the role of the leader as a doer and an exemplar, and ensure that things are done in the right way at all levels. Know how to influence a mass of people to fulfil the purpose of your organisation, and design a psychological contract that allows employees to do the extraordinary. 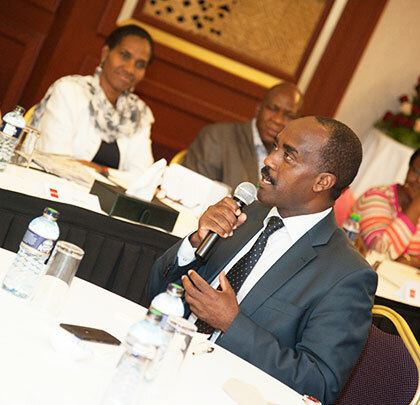 FFWD has been attended by a wide range of East Africa’s finest executives.